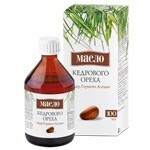 It is recommended as a dietary food supplement - a source of tannins, catechins, containing flavonoids, salidroside. 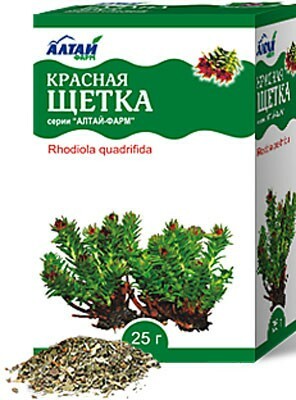 Ingredients: Rhodiola four-, rhizomes with roots (100%). Red Brush - a unique plant, which is a unique gift of nature of Gorny Altai. It is called the" gift of the woman "as a red brush, in particular, prepared as a tincture, has a phenomenal healing effect on the female body. In addition, the red brush helps eliminate disturbances in the endocrine system of the body, improves immunity and overall tone organizma. 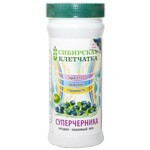 Krasnaya brush is contraindicated in case of intolerance of components, as well as women during gestation, lactation. It is also desirable to use it for atherosclerosis, increased excitability, sleep disorders, high blood pressure, cardiac abnormalities deyatelnosti. Primenyat herbal tea should be as follows: one teaspoon (about half a gram), herbal tea pour one cup of boiling water, then give the tea brew for fifteen or twenty minutes, then strain. Recommended take 1/3 cup three times a day, preferably before noon (morning) and during the duration of administration edy. Obychnaya - mesyats. Hranite a red toothbrush in a dry, dark place, keeping the temperature from two to eighteen degrees above zero Celsius. Packaged in boxes of twenty-five grams, and filter-packs of 1. 5 gBefore use, you should consult with your doctor! Biologically active food supplements - herbal tea Red brush.